I decided to show one more photo of the flowers along the walkway to the beach next to our condo. This is a wild ginger flower, known locally as a cana agria. The flowers are about 7 cm by 10 cm, or about 3 by 4 inches. The flowers have a yellow throat in the center. They remind me of the size and shape of the cactus flowers in our backyard in Arizona that my wife often shows in her macro photos on her Scottsdale (Arizona) Daily Photo site. We are showing photos of the remoteness of Aitutaki, in the Cook Islands of the South Pacific, on our Viva la Voyage travel photo site. 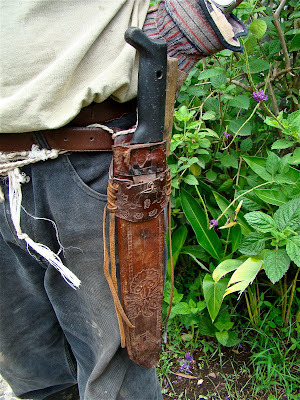 Yesterday I showed a photo of Pablo's machete in its leather sheath. Here is a photo of Pablo using a machete to cut the height of the pinuella plants that divide our condo from the beach. This is obviously a much longer machete than the one that he had in his sheath that I showed yesterday. Pablo will obviously keep himself trim getting exercise such as this. In addition to working full time as the gardener at our condo building, he owns a pasture outside the village where he lives and he raises horses on his land and tends to them. On our Viva la Voyage travel photo site this week we are showing photos of the remoteness of Aitutaki, in the Cook Islands of the South Pacific. This is a photo of the machete of Pablo, the gardener at our Langosta Beach condo. I showed a photo of him a few days ago. He is responsible for trimming all of the bushes and tending to the gardens around our condo building. Pablo does not use an electric or gas powered clippers or trimmer. He uses a machete, as you see here, tied around his waist with a rope in a handsome leather sheath. As you shown in this photo, his sheath and machete have gotten a lot of use. It can be tough work, but Pablo keeps a sunny disposition and always has a friendly greeting for the owners and guests at the condo. Tomorrow I will show a photo of Pablo and his machete in action. Today is Sunday, so we have new photo on our Viva la Voyage travel photo site. This week we are showing photos of the remoteness of Aitutaki, in the Cook Islands of the South Pacific. This is a photo of a heliconia flower on the path to the beach alongside our condo that I showed a few days ago. There are lots of varieties of heliconia in Costa Rica, and this photo shows the most common type. Its scientific name is heliconia latispatha, and it is also know as platanilla or wild plantain. They have a fleshy fruit in September - November, which is food for birds and mammals. The flowers and fruit grow up, like bananas. Tomorrow, to build on this little series of some of the flowers at our condo that are tended to so well by Pablo, the gardener, I will show you how Pablo trims the bushes. This week on our Viva la Voyage travel photo site we are showing photos of the people and architecture of India. It is well worth a click and a visit. These flowers around our condo provide a nice habitat for butterflies. 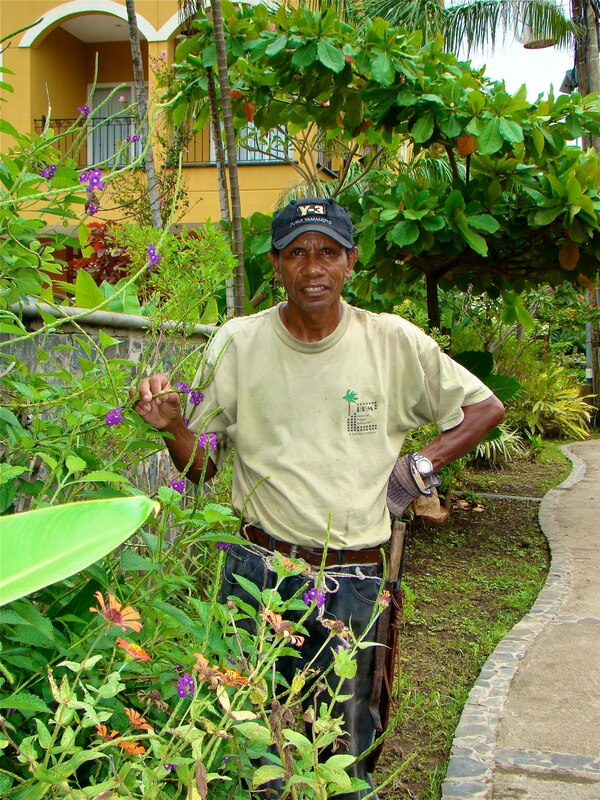 I showed a photo a few days ago of Pablo, our gardener, and he takes special care of the flowering plants, as he likes to keep flowers in bloom all of the time, year-round. We are showing photos of the people and architecture of India this week on our Viva la Voyage travel photo site. This is a photo of one of the plants and flowers on the path to the beach that I showed yesterday. Our condo building is in the background. You will notice that there are two yellow butterflies on this flower. I do not know the type of flowering tree that this is, but it is a unique flower. It reminded me of a feather-duster, with delicate flowery spindles that you can see through. These flowering twigs had yellow butterflies flittering about and landing on them for brief moments. This week we are showing some of our favorite photos of India on our Viva la Voyage travel photo site. This is a photo of the path that runs along our Playa Langosta condo to reach the beach. We can go directly from the condo pool area out a back gate to the beach, but the developer of the condo, as a courtesy to the neighborhood, installed this path alongside the condo building so that others in the area would have a convenient and attractive walkway to reach the beach in this location. All beaches in Costa Rica are public property, but almost as important is to provide easy ways for people to reach the beaches. This walkway has a variety of flowering plants and trees that line the path, and the are usually plenty of butterflies flying around. We invite you to take a look at photos of the people and architecture of India on our Viva la Voyage travel photo site. This is a photo of Pablo, the gardener who works at our Langosta condo building. He has pride in his work and does a wonderful job. He speaks English well and is helpful and friendly to the owners and guests of the condo building. The people who rent our condo will sometimes send me emails or leave comments complimenting Pablo or Luis, the security guard who opens the gate for them and watches over the building. This week on our Viva la Voyage travel photo site we are showing striking photos of the people and architecture of India. The gardens and buildings at the Tamarindo Diria Resort have stone statues with pre-Columbian themes decorating the grounds. This is a photo of a stone head statue in the gardens near our condo building at the Diria. I am sure that children who visit can let their imaginations run wild, with images of Indiana Jones adventures among the tropical motifs of the gardens and statues. On our Viva la Voyage travel photo site this week we are showing photos of the architecture and people of India. I highly recommend that you take a look. 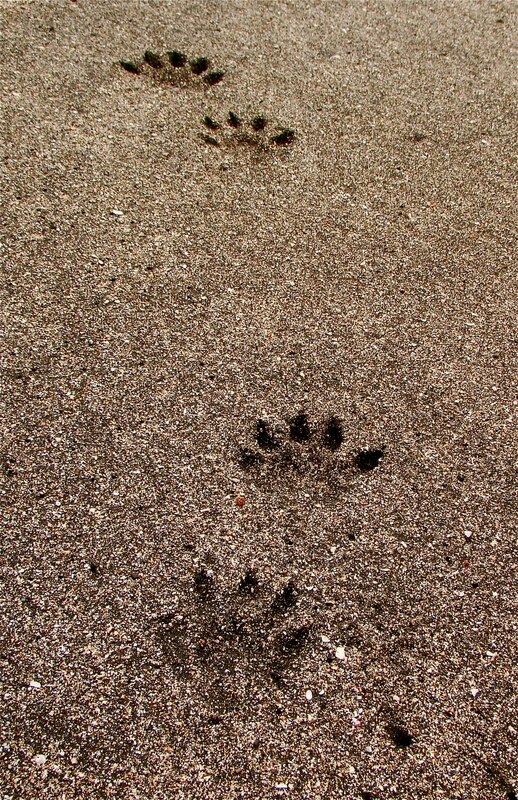 Yesterday I showed a photo of what I surmised to be raccoon tracks on Langosta beach in the morning. What were raccoons doing on the beach? Probably catching and eating crabs. Raccoons in Costa Rica eat crabs. The raccoons have very dexterous fingers and can open up the crabs to eat. Raccoons come out at night, and these crabs also come out at night, which makes them a prime food source for the raccoons. As you can see by our car headlights in the top left corner of the photo, this crab was crossing the road along the beach road between Tamarindo and Playa Langosta when I stopped to get out to take his photo for this website. I guess raccoons are braver than I am. I kept my camera safely between my hands and this crab. I don't think I would try to handle this or other crabs, no matter how much I might like to eat crab meat. Today is Sunday, and we have a special treat this week, posted on our Viva la Voyage travel photo site. If you have not been to India, a preview is only a click away, featuring some of the remarkable architecture and people. Here is a photo of some footprints on the beach at Playa Langosta. In the morning it is common to see these type of footprints. What type of animal do you think made these footprints? These are obviously not a dog's footprints, as dogs do not leave footprints with five toes. My guess is that a raccoon made the footprints in this photo. No, I have not sat out on the beach at night to try to verify my suspicion. We see raccoons walking the neighborhood more commonly than olingos or monkeys, which we also see. Tomorrow I will show you a photo of what the raccoons are probably looking to eat when they walk along the beach. This week we are showing photos of the architectural details of Budapest, Hungary, on our Viva la Voyage travel photo site. This is a photo of one of the boats used for the wildlife river trips on the Tempisque River in Palo Verde National Park. These trips are similar to the Jungle Cruise at Disney World, except the animals are real, and the river guides do not tell a bunch of corny jokes and puns. There are tour guides who make the arrangements and drive visitors from Tamarindo to the river dock where the boats start their wildlife tours. I have been on this trip 5 or 6 times. The photos I have posted recently of the crocodiles and white-faced Capuchin monkeys were taken on one of these trips that I took with my brother-in-law last month. We are showing photos of the architectural details of Budapest, Hungary this week on our Viva la Voyage travel photo site. OK. This is not a nice crocodile. This is a photo of a large, hungry crocodile. Several people yesterday left comments that they hoped my crocodile photos were taken with a telephoto lens. They were not. I took this photo from a distance of about 6 or 7 feet, a little more than 2 meters. I was in the safety of a boat. You can tell from the angle of the photograph that I was shooting down on the crocodile at close range, as I could not get this angle if I were far away from the crocodile. Once I was taking a photo of a crocodile on a river bank at such close range that when he scampered into the river he splattered me with mud. Because of the comments I had yesterday, I will change my post for tomorrow and show the type of boat used for the wildlife trips for photographs such as these. We are showing photos of architectural details of Budapest, Hungary, on our Viva la Voyage travel photo site this week. The crocodile in this photo does not look mean, does he? He looks almost friendly, if you can overlook the many sharp teeth. Crocodiles look menacing when lurking at the surface of the water. Crocodiles look terrifying when their mouths are open. Tune in again tomorrow. Today's photo is a tease. I took this photo while on a wildlife boat trip in Palo Verde National Park. 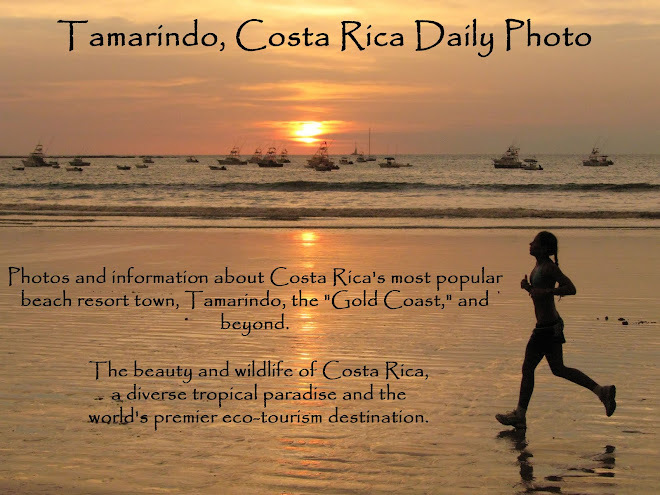 I recommend these trips to the people who rent our condos in Tamarindo. We are showing photos of the architectural details of Budapest, Hungary, on our Viva la Voyage travel photos site. Usually when I show wildlife I try to show exotic, tropical animals such as monkeys, crocodiles and iguanas. But this squirrel is so pretty I had to show a photo of it. There are squirrels like this who hang out in the trees near our Langosta Beach condo. Squirrel are rodents, of course. 43% of the more than 4,000 species of mammals are rodents. 350 of the 1750 species of rodents are squirrels. My Costa Rican wildlife book, which is the source of this information, comments that rodents are rarely encountered by visitors to Costa Rica, although there are 5 species of squirrels in the country. I think this is a red-tailed squirrel, judging from his body color, although perhaps he is old and that accounts for his gray head, spine and tail. My book shows red squirrels without the gray coloration. Here is another thing I learned while doing my reading for this post. The word rodent comes from the Latin rodere, which means "to gnaw." Their sharp teeth enable them to gnaw into nuts and other vegetation, or, in the case of beavers, trees. 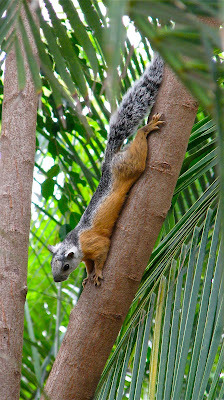 The red-tailed squirrels are known locally in Costa Rica as ardilla roja. We are showing photos of some of the architectural details of Budapest, Hungary, this week on our Viva la Voyage travel photo site. When I fly to the international airport in Liberia, Costa Rica, I ask for a window seat on the left side of the plane if I will be arriving during daylight. The reason is that there will be a nice view of the Pacific coast of Costa Rica and a direct view of the Gulf of Papagayo and the Papagayo Peninsula as the plane makes its descent towards the Liberia Airport. Here you can see the entire length of the Papagayo Peninsula, from the mainland to the tip. The entire peninsula is gated and is reserved for residents and guests of the Four Seasons Resort, which is located in the narrow saddle near the end of the peninsula. The fairways of the golf course are the green patches that trace the spine of the peninsula. This week we are showing photos of architectural details of Budapest, Hungary on our Viva la Voyage travel photo site. Here is a photo of the same surf fisherman as yesterday. I showed a similar photo of him a couple of weeks ago. Judging fro the comments I received, people liked the photo, so I am showing another photo today. For this photo, I maneuvered behind him so that I would catch a tropical rainstorm off shore in the background. Tamarindo is sunny and clear virtually every day from November until April. I took this photo last month. In the summer the skies can sunny and blue for part of the day, and then dramatic clouds can roll in, then the sun can peak through yet again. Today is Sunday, so we have new photos on our Viva la Voyage travel photo site. After last week's photos of Papeete, Tahiti, we are taking you to a very different place this week be showing some architectural details of Budapest, Hungary. Here is a surf fisherman, and there is a fish on his line, if you look closely in the lower right corner. Has he caught a small fish? No. The fish on his line is his bait. I am not a fisherman, but I do surmise that if he is using a bait fish of that size, he is looking to catch a much larger fish. I asked him how the fishing was. He told me it was very good the day before I took this photo, but he had not yet had much luck this day. This fisherman is a Canadian who has a condo near the beach in Playa Langosta, where I took this photo. He said that he is building a house on the beach. That will make it easier for him to fish, and the fish will be even fresher to take time to cook. We are showing photos of Papeete, Tahiti, this week on our Viva la Voyage travel photo site. It is mid afternoon, as you can tell from the direction of the sun over the ocean to the west. But there is still enough daylight to make it worthwhile for this surfer girl to walk north along Tamarindo Beach, heading from the southern end where the waves are sheltered towards the northern part of Tamarindo Beach that is popular with surfers. This looks like the type of afternoon that could produce a dramatic sunset, and in the meantime, why not relax on the beach and watch the surfers? Here is a photo of the bananas flambe desert at Coconut Restaurant, with the flaming liquid caught in mid pour. On the table cloth you can see the shadow of the arm of the server, the container, and the flaming stream. If you would think about dinner in a Costa Rican beach town, would filet mignon and bananas flambe come to mind as what you would expect? In addition to an extensive menu of appetizers/salads, entrees and deserts, Coconut also offers a prix fixe special in which diners can choose any two courses from among about a dozen appetizers/salads, a dozen entrees, and about a half dozen deserts, for a total of $25 USD. As you saw yesterday, I chose the filet mignon for my entree, which came with vegetables and mashed potatoes, and bananas flambe for desert. They had a chocolate desert which is what I normally would have chosen, but I figured the bananas flambe would make a better photo. Oh, the sacrifices one makes to be a Daily Photo blogger. This week on Viva la Voyage, our travel photo site, showing photos of Papeete, Tahiti. One of the best restaurants in Tamarindo is Coconut. Like many of the fine dining restaurants in Tamarindo, it is owned by a European. Katarina, a native of Norway, keeps a close eye on the food and service to make sure both are impeccable. One of the specialties is lobster, although on my recent visit I had the filet mignon because I have enjoyed the lobster in the past. The filet, which I am showing in the second photo, is wrapped in bacon and smothered in mushrooms. We talked to Katarina about the restaurant business. In addition to being a Norwagian, she has lived in the USA and was in the cosmetics industry in Paris until coming to Tamarindo 8 years ago to go into the restaurant business. Coconut is open only for dinner. Tomorrow I will show you the very special desert, and tell you the price of the dinner. This is a close up of the yellow flower that is mixed in with the purple flowers that I showed yesterday. The purple is so overwhelming that it is possible to overlook the delicate yellow flowers mixed in with the purple. We are showing photos of Papeete, Tahiti on our Viva la Voyage travel photo site this week. There are a lot of these type of flowers around our Langosta Beach condo. Sorry, but I do not know the name of the plant. The colorful flowers that surround our condo building provide a nice haven for butterflies. Pablo, the gardener, takes excellent care of the flowers, and I will show some more photos of him in a week or two. There is something about the ocean, whether it be a sunny blue day or a stormy day, that is relaxing and mesmerizing. Even when the weather is not perfect, I enjoy watching and listening to the endless series of waves as they roll in, and wondering what people on the other side of the ocean are thinking and doing. Today is Sunday, so we have new photos on Viva la Voyage, our travel photo site. This week we will take you across this same Pacific Ocean to show photos of Papeete, Tahiti. Monkey: "Help. Let go of me." White-faced Capuchin monkeys like to jump on the roofs of the boats used for the wildlife boat cruises in Palo Verde National Park. The roofs of the boats are flat, dry, and have a little bounce to them, unlike the dirt and trees in the jungle where the monkeys normally hang out. These monkeys were wrestling on the roof while we watched from the bow of the boat. We had as many as 10 monkeys playing around on our boat and an adjacent boat. In future posts I will show some of the monkeys while they were jumping up and down like on a trampoline. The fishing village of Burano, Italy, near the mouth of the Venetian lagoon is the subject of our photos this week on Viva la Voyage, our travel photo site. I had to stop to bend down and take some photos of leaf cutter ants walking along the edge of a stairway in a garden. The advantage of this location for photographing leaf cutter ants is that I could get my camera down to the the same level as the ants and take some close photos with my macro setting. Leaf cutter ants are remarkable for several reasons. They to not eat the leaves that they carry back to their underground nests. They feed the leaves to a fungus, and they eat the fungus. It amazes me that they can carry leaves much bigger than they are, as you can see here. They travel in lines, and they work so hard that they will even pass a comrade like they are in a race, as is happening here. This week we are showing photos of the colorful island of Burano in Venice, Italy, on Viva la Voyage, our travel photo site. About a week ago I posted a photo of a young man walking along the beach carrying his surfboard. A couple of people wondered if he was a good surfer, band I have to confess that I did not observe him as he was surfing. I took the photo during the late afternoon, so it was hard to squint and look directly into the sun to try to watch individual surfers. But, since people are evidently interested in checking out surfing form, here is a photo I took a while back of a surfer on Tamarindo beach. I took this photo with my little waterproof camera, which has broken, but it did allow me to get out into the waves with the surfers for photos like these. The fishing village of Burano, Italy, near the mouth of the Venetian lagoon is the subject of our photos onViva la Voyage, our travel photo site. After a couple of days of photos of tranquil plants, here is a photo of the fury of the Pacific Ocean crashing against the rocks along the coast on a portion of Playa Langosta. There was a storm out to sea, and that kicked up the waves rolling in and crashing against the volcanic outcropping of rocks that appear below the ocean surface at low tide. The fishing village of Burano, Italy, near the mouth of the Venetian lagoon is the subject of our photos on Viva la Voyage, our travel photo site. Here is a closer view of the red leaves that I showed yesterday. Perhaps someone will know shat type of plant this is. I have looked in my Costa Rican plant field guide, but without any luck. 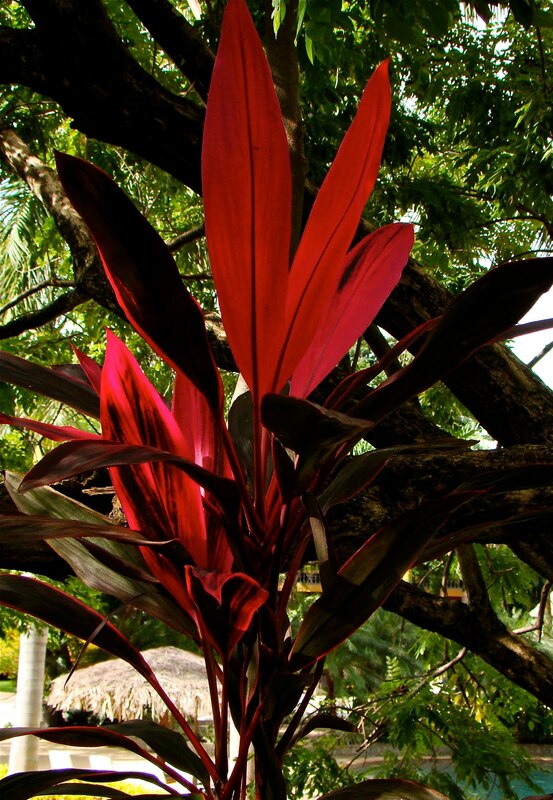 Supplement: JM has left a comment suggesting that this plant is a cordyline terminalis. JM is very knowledgeable about plants and animals, as reflected by his several, outstanding, photoblogs, so his answer is good enough for me. This week we have posted photos of Burano, Italy, where some of the houses are the color of these leaves. Please check out our Viva la Voyage travel photo site to take a look. The gardens on the grounds of the Diria Resort around our condo are lush and green, which drew my attention to the plant with red leaves reaching upward beneath the canopy of the trees. I do not know what type of plant it is, but I like it. It is somewhat like a summertime poinsettia. With yesterday's Daily Photo theme of "bright colors," I thought I would carry the theme forward for another day or two. The swimming pool and thatched roof swim-up bar and snack bar of the Diria Resort are barely visible through the vegetation in the distance. This week we are showing photos of Burano, Italy, on our Viva la Voyage travel photo site. Burano is a fisherman's island near the mouth of the Venetian lagoon, with simple but brightly colored houses. > The worldwide Daily Photo theme for August 1 is "Bright Colors." I have chosen photos of an art exhibition in Tamarindo in July featuring Costa Rican artist Felix Murillo, whose work certainly contains bright colors. The second photo shows a room full of Felix Murillo's paintings. He is a largely self-taught, 39 year old Costa Rican artist who has a gallery in Jaco. Some of his works carry the viewer into an aquatic dream of fish and other fanciful figures. The table in the center displays the fused glass art of Andrea Amano. Both artists had their work on display in an exhibition during the first half of July in temporary space on the first floor of the Pacific Park condominium building in the enter of Tamarindo. I apologize that the spotlighting on the paintings made them difficult to photograph. I encourage you to check out the websites of Felix Murillo and Andrea Amano glass. Both websites have photo galleries of their work. Today is Sunday, we have new photos, this week of the colorful island of Burano, Italy, in the Venetian lagoon, posted on our Viva la Voyage travel photo site.